She’s Kinda Crafty has lots of colorful ribbon displayed in a super organized way…visit her blog for all the details on this DIY ribbon holder. You might not normally think to display ribbon in a vase, but it works! Why not keep your ribbon in jars? 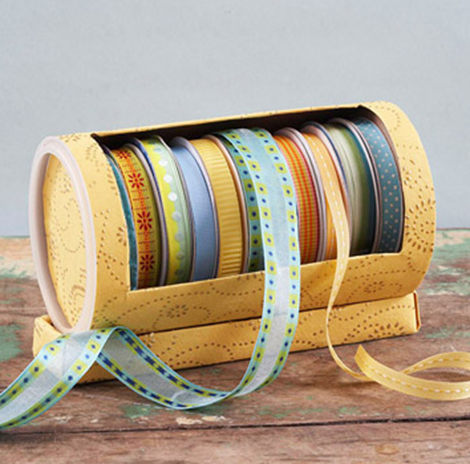 This is great for those little ribbon scraps that you don’t want to waste! 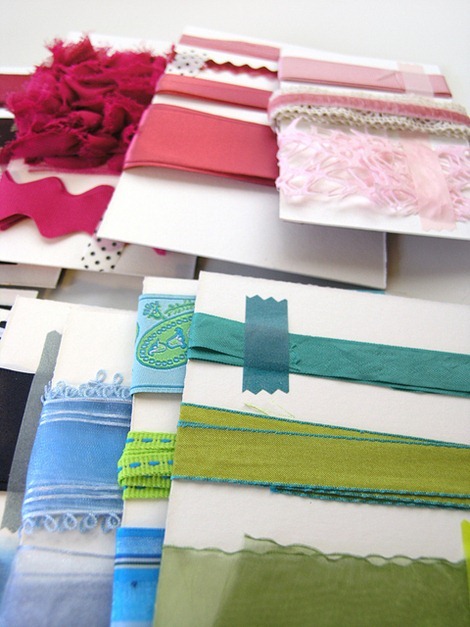 Never throw away pretty scraps of ribbon, NEVER…I’m just saying! Can you guess what this ribbon holder is made out of? An empty oatmeal container…Wow! Cut a hole, cover it with beautiful paper and you’ll create a great little ribbon holder in a matter of minutes! Close to My Art created this lovely ribbon holder! I need one of these! 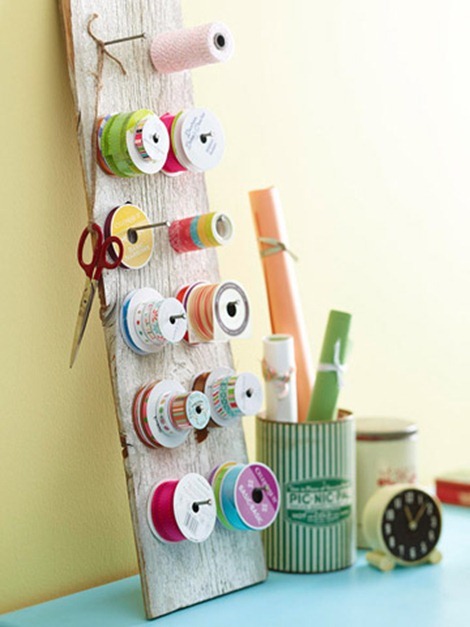 A wooden plank and a few nails can turn into a simply unique ribbon holder. Why didn’t I think of that?! 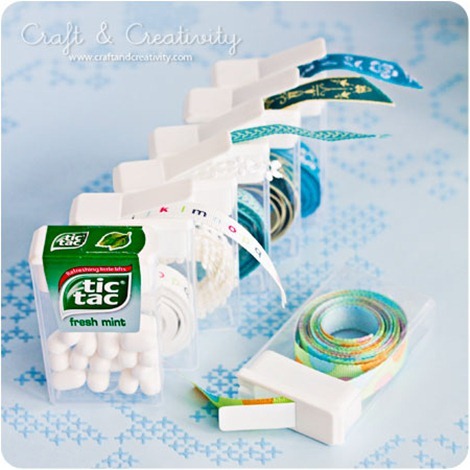 This is one of the cutest recycled ribbon holders ever…tic tac containers!! So fresh! 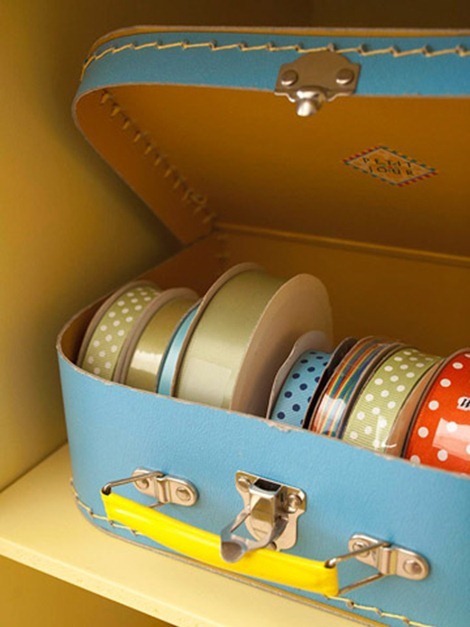 Store your extra ribbon in a suitcase. Mini suitcases are available all over now and they look great stacked on your shelf. 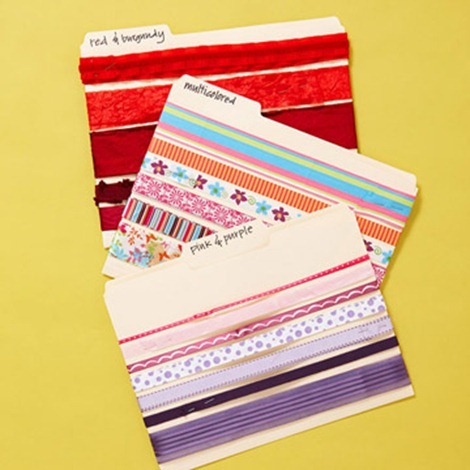 Wrap small pieces of ribbon around index cards and secure with tape…quick & easy! 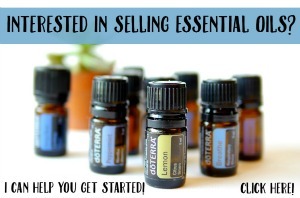 You can keep them in a little recipe box on your desk. This idea is just so beautiful…use an old wooden typesetter! 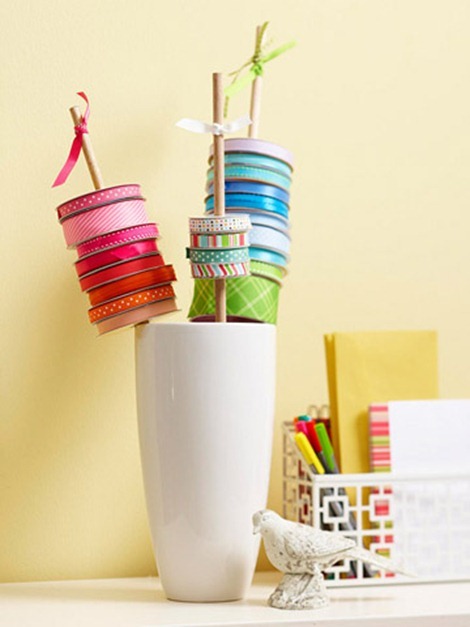 A paper towel holder can be a quick way to organize your large ribbon. 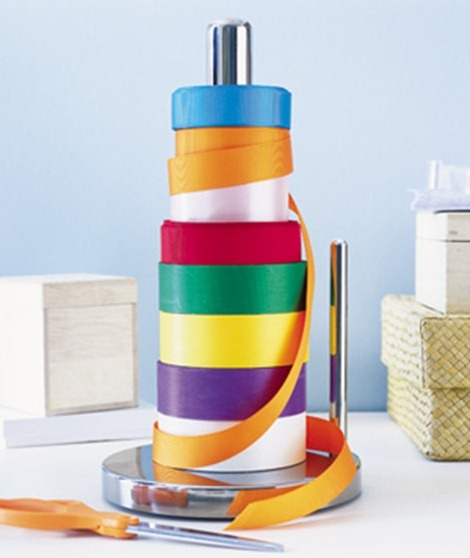 Secure the ribbon with a small piece of tape and you’ll have a stack of colorful ribbon ready for you the next time you need it. Do you have tons of extra folders like I do? Wrap ribbon on folder and file them by color or style. 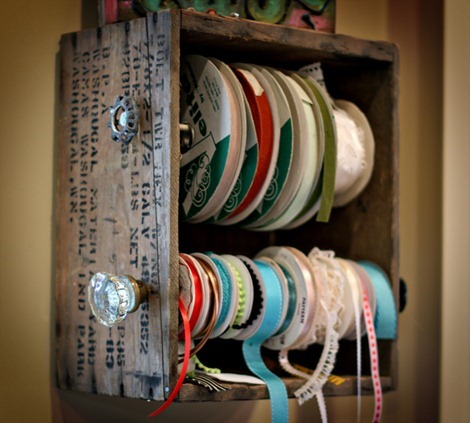 This is a great ribbon organizer that you can create without much fuss…make as many as you need! 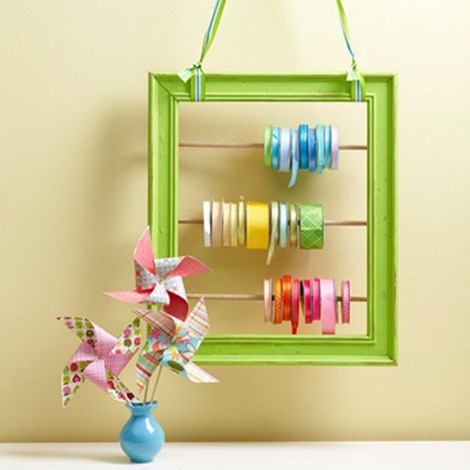 This framed ribbon holder is so creative! I feel inspired to make something just looking at it! This is the perfect ribbon holder for your book loving friends…a book ribbon holder, of course! 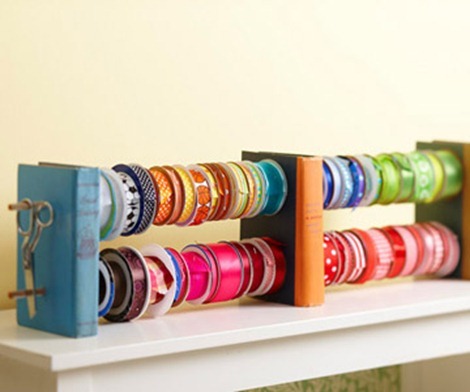 Bright and Blithe shared this adorable little ribbon holder on Flickr. I just had to show it to you! I love lots and lots of ribbon! It’s perfect for gifts, wreaths, hair bows, scrapbooking and a million other pretty things. Can you have too much? I don’t think so…you just have to keep it organized! What do you think? 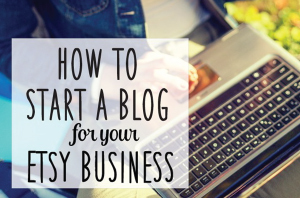 Did you find a new idea or two? 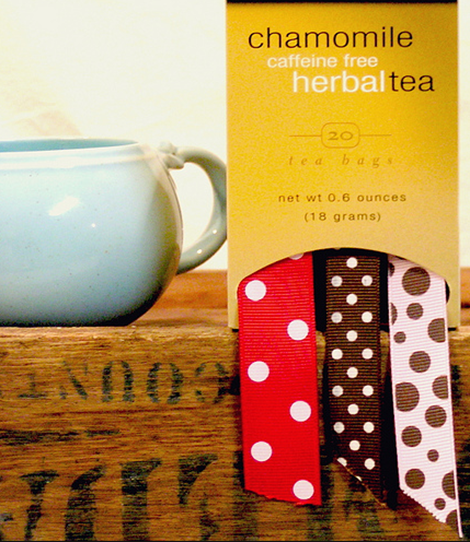 How do you keep your ribbon under control? 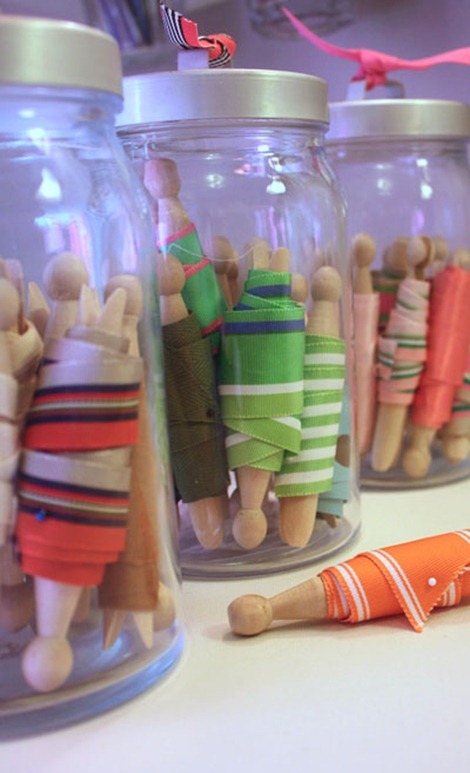 I’ve been collecting old clothes pins and wooden spools for this purpose. If I still ate tic tacs, I’d use them for ribbons (or beads). I like the frame look. I love all of these ideas, but when your ribbon stash is as huge as mine, well, most of those you mentioned wouldn’t even begin to suffice. I’d love to post a pic of how I store my huge collection. 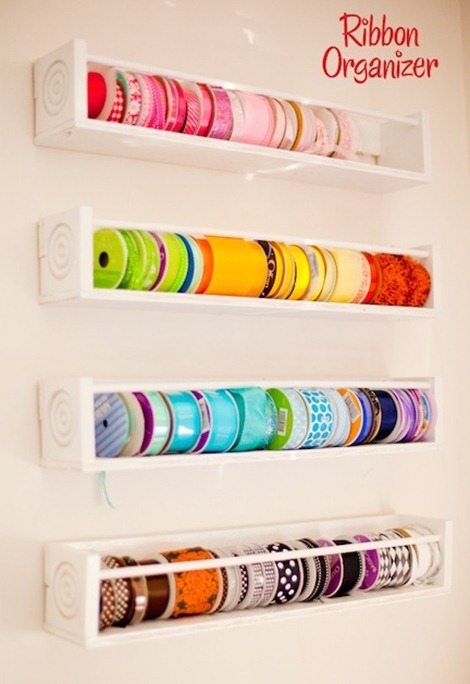 I have slat boards attached to the wall with shelves and baskets full of ribbon on rolls. It takes up a whole wall in my craft room. I agree with Suzann. I have sorta giant rolls and really no way to make it look as totally cute as those tic tact boxes! I have it hanging from a peg rack shelf (the brackets part with an actual shelf) and then a long dowel rod between the two shelf brackets. Not cute, but effective. 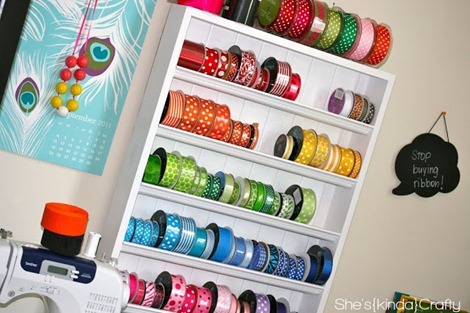 I have my ribbons stored in a bin, but I wish I had a craft room to show them off like they have here.. I love all of the ideas the colors are fabulous! I might be able to use some of these ideas anyway! Love the ideas I see, I did come up with a slightly different idea. I found a small pallet board placed a few stickers on it, placed 2 cup holders hooks in the bottom , used dowel rods(where I placed my ribbons, according to color, used decorative color parachute cord to hold the rods together. Placed cup hooks in bottom of dowel rods, , and used an over the door hooks for the closet door in my craft room. 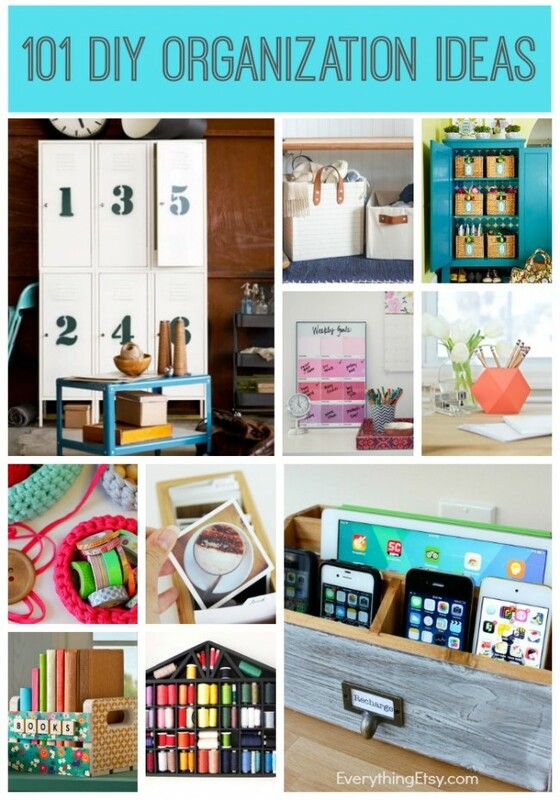 A pretty and functional organizational idea.